I’ll be doing a series of house-concert style readings in May, June, and July of this year, thanks to the generosity and kindness of a group of arts-loving and supportive hosts! So…In a contemporary twist on the ancient traveling bard, and modeling after the genius of our brother and sister artists in the indie music industry, this poet’s taking the show on the road! In case you’re not familiar, what’s a house concert? House concert events are small, intimate, and generally by invitation only. Guests make a suggested donation to pay the artist. When you add your donation to the kitty at a house concert, you are paying an accomplished, professional artist directly for the evening’s entertainment. The arts and artists, all of them, unfortunately, often have to fight for space and funding to keep from getting lost in the drone of the larger commercial culture, and mostly for very little compensation. Fortunately, a house concert can pay an artist respectably via a room full of just 20 or 30 art lovers. It’s an inexpensive high-quality evening out for attendees, and the artist gets paid a living wage. Everybody wins! In my case, each donation will be rewarded with a personally inscribed copy of the new book. 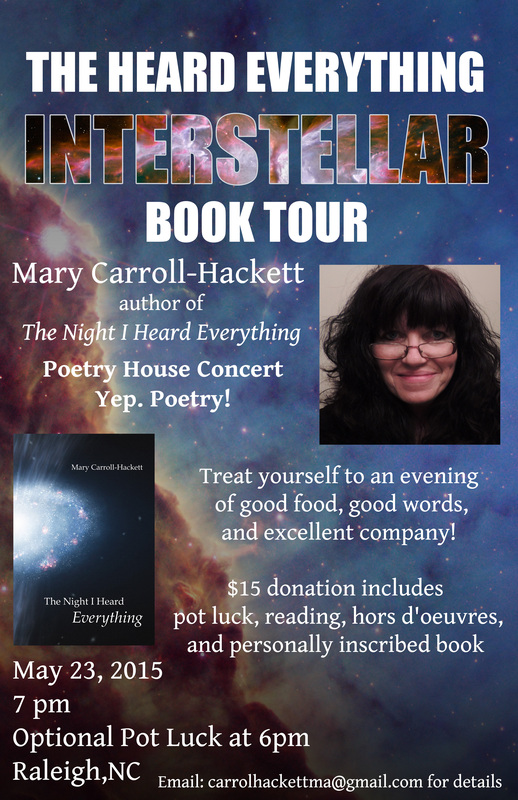 So The Heard Everything Interstellar Book Release Tour is born! Why Interstellar? Because my hosts are the real STARS!